This owl species makes its unlikely home in wetland habitat. They roost on the ground in drainage lines or in areas that have not been burnt or trampled by cattle. They are found on the eastern side of South Africa in areas of higher rainfall which facilitates their preference for long thick, rank. Grass owls are completely nocturnal and are only seen during the day if disturbed. When flushed they fly up with long legs dangling, but immediately drop again to the ground nearby. They may be found singly, in pairs or in family groups after the breeding season. The Grass owl is a medium-sized bird with a large, moon-like facial disc, no ear-tufts and long legs. Their backs are a dark brown colour and their stomachs a spotted gold. Although their body colour remains consistent, their prominent faces change from juvenile brown into white at adulthood. Grass Owls are most similar in looks to the smaller and more common Barn Owl and in habitat and behaviour to the Marsh Owl. 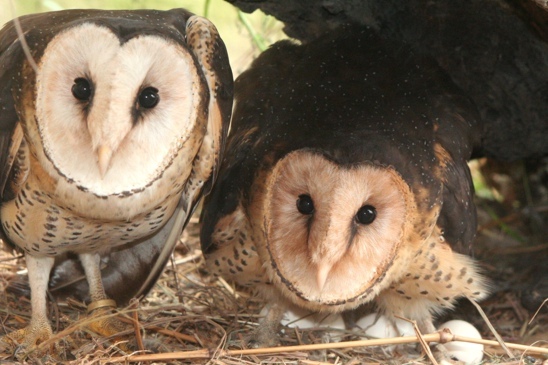 Grass Owls have a quartering hunting style whereby they systematically fly low over an area looking for their prey of rodents, shrews, some birds and insects. Their flat facial disc allows them to locate their prey by sound as well as eyesight. When they locate the unsuspecting creature they plunge into the grass with legs extended to catch it with sharp talons. Their favourite meal is the vlei rat and their worst choice probably frogs. Owls swallow their prey whole and 12 to 24 hours later they regurgitate a compact pellet of all indigestible bones, fur, feathers and shells. They roost in regular locations and you can see an active roost site by the accumulation of these compact pellets. Males and females roost apart during the day. When they breed, she lays up to 4 eggs at either spot. The eggs are laid on a pad of grass at the end of inter-leading grassy passageways, made by the parent owls. The female incubates and the male feeds her. They repeat a rhythmic clicking call that rises to a pitch as they approach each other in flight or as they bring prey to the nest. At five weeks of age the young owls start to move about and will hide in other compartments if disturbed and at seven weeks they start to fly. Grass owls are listed as a vulnerable species, requiring concentrated conservation attention in order to ensure their survival. There are less than 5000 Grass owls left in South Africa. Much of their habitat is being destroyed by industrialization and urbanization. Grass owls are very sensitive to deterioration in ground cover brought about by overgrazing or drought. They breed in autumn to early winter, when there is maximum grass cover, but their nests then become susceptible to destruction by fire. The chicks’ critical fledging period is from March to May and landowners are asked to please not burn at this time. Grass owls are also prone to being hit by motor vehicles because of their low-level hunting style. Grain spillage from transport trucks attracts rats to the roadside, which in turn attracts hungry owls. Certain hot spots have been highlighted where there are high motor vehicle mortalities (like on the N17 in Springs, Gauteng). Although blinded by your headlights, if an owl can hear you coming, they will try and get out of the way. So when travelling our highways and byways, do your bit and “Hoot” if you see an owl.